Cranswicks PLC, one of Britain's foremost suppliers of gourmet sausages and premium cooked meats, have taken delivery of the latest of their Codeology P100 Print and Apply systems. Cranswicks were one of the first customers in the U.K. to buy the newly-launched P100 two years ago, since then they have installed more new production lines and on each one bought another P100 Print and Apply system. Phil Bargh, Divisional Engineering Manager of Cranswicks, commented 'We met with Codeology when the takeover of our existing labelling machinery supplier raised support issues. They offered equipment that worked in a similar way to our existing printers and were compatible with our label design software, which kept training requirements simple and minimised the impact of changing over on our business. I felt confident that Codeology could provide support with their expertise and designs of alternative systems to those on the market at that time. My confidence has been fully justified'. 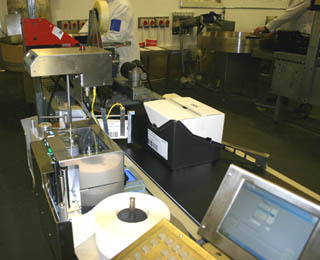 Each system has been installed with a Codeology Industrial Computer running Cranswick's label design software, with both computer and P100 installed on a self-contained conveyor system.